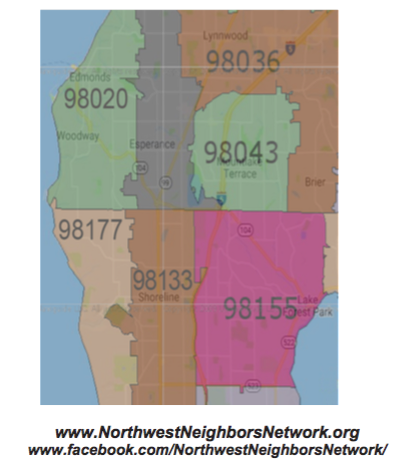 Northwest Neighbors Network was created with the intention of forming a strong and extensive Hub & Spoke Village Network to serve North King/South Snohomish Counties. Over time we plan to roll out three or more villages as spokes connected to an administrative “hub”. The initial service area is concentrated on Shoreline/Lake Forest Park. People living in the other neighborhoods may currently join as affiliate members at a reduced fee, participating in the social activities and receiving services when available in the larger area.